Like ALL little girls, my wife Dayna dreamt of celebrating her honeymoon by driving a 1966 Thunderbird into the Grand Canyon. Don’t get me wrong, I like “Thelma and Louise” just as much as the next guy whose fiancé, like his mother before, forced him to watch it with her instead of letting him hang out with his friends. But as much as I love my wife, I knew in my gut that our friends and family would probably be less than inspired by our faithful reenactment of the film’s climactic scene. As a compromise, instead of a trip to Southeast Asia, we took a 10-day road trip through the American Southwest; only minus the gruesome, flaming, vehicular double suicide. It was everything we could have ever wanted in a honeymoon -- fun, romantic, silly, relaxing, and bittersweet when it ended. We set out from our house in Oakland, California on a patchy clouded Bay Area Friday afternoon with the goal of driving straight through to stop one. Though, we both silently accepted the forgone reality that our sense of adventure would wane with the onset of road hypnosis, and we would inevitably stop at one of the many miscellaneous towns, such as Barstow, CA, dotting the 12-hour stretch of deserty, scrubby road between Oakland and our first destination -- Sedona. We awoke early on day two invigorated by the welcome embrace of Barstow and its many restaurant chain breakfast options (and by awoke I mean, decided to relent in the face of the Sisyphean task of staying asleep on the concrete block that passed for a pillow at the illustrious California Inn). Owing to our early rising, we made like Romans and enjoyed a hearty meal at the local IHOP, which was mere stumbling distance from the good ole California Inn. As an aside, being that I haven’t eaten at an IHOP in maybe 10 years, I would be remiss if this review didn’t contain a call to arms for all my fellow Americans to try the IHOP Cinnastack pancakes; a four-layer pancake tower mortared together with cinnamon icing and slathered at the end with regular icing and whipped cream just for good measure. I can’t attest to its deliciousness myself. I was somehow able to wrest my attention from its diabetes-inducing gaze, but what could be more American than eating a giant cinnamon roll cake disguised as breakfast in the form of good ole flapjacks? After wrapping up our positively honeymoon-esque Barstow experience with a laugh and a shrug, we set forth for green . . .errrr . . . redder pastures. The drive from Barstow to Sedona is surprisingly pretty, meandering along highway 40 through the Mojave desert’s yuccas, scrubby desert plants, and sand dunes all the way through the lush evergreen Arizona high country into Flagstaff, and then finally plunging down 2,000 feet along snake-like Arizona 89 into Sedona. Don’t get too excited about Sedona just yet though. One my wife’s greatest guilty pleasures is kitschy roadside attractions, but hey, it is what it is. The Bay Area and kitsch are like Miami and shiny shirts. 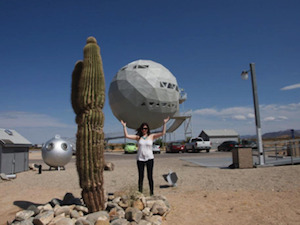 I am occasionally able to quell Dayna’s childlike exuberance and avoid pitstops at giant balls of yarn, fake ghost towns and the like on our road trips, but Yucca Arizona’s Area 66, a.k.a. the Arizona Death Star, created an unavoidable critical mass of excitement just two-and-a-half hours into our trek. It was originally constructed in 1976, at the time known as “The Dinesphere - Space Station Restaurant”. It was the tour de force of a 1970s real-estate venture (read – scam) in which a few less than forthright developers bought up desert land and sold plots, sight unseen, to numerous unknowing buyers promising a desert oasis near Lake Havasu, which in reality was approximately 40 miles away. The developers subsequently disappeared and bankrupted the development corporation. The giant golf ball-shaped structure went unused until 1981, when an eccentric Wyoming man bought it as a birthday present for his wife, which they renovated to create a 3,400 square foot residence. Unfortunately that means that no visitors are allowed inside. After ogling the fake rubber aliens and scrapyard UFO sculptures that inhabit the parking lot, we took a few novelty shots of Dayna holding up the geodesic dome, purchased some bottled water and shoved off. The final 10-15 miles of road along Highway 89 into Sedona is breathtaking. Rust red peaks carved by ancient seas jut out above you in undulating fashion like a Martian landscape. Continuing on through Oak Creek Canyon’s lush greenery, quaint hotels, B&Bs, and private residences unobtrusively line the river the below. Southbound Highway 89 from Flagstaff to the north ultimately opens up from the winding trip through the canyon and welcomes visitors into to the epicenter of Sedona’s commercial district - a bustling (inasmuch as Sedona can bustle) mishmash of restaurants, tour group storefronts, jewelry stores, art galleries, and southwestern knick knack shops, all of which is cradled by the rising mountains on all sides like a sort of rust colored Eden. Thanks to our five-star sleeping accommodations back in Barstow, we were able to get on the road early enough to make it Sedona with enough time to grab lunch at the highly recommended Cowboy Club. Frankly, the food wasn’t particularly memorable (literally – I don’t recall what I ate), but the prickly pear margaritas were more than generous, not that expensive ($10 bucks for a giant margarita at a steakhouse in a major tourist area) and delicious. After walking off our lunch time buzz by checking out a few shops and stopping in at the Pink Jeep office to book a tour for the following day, we decided to hoof it the half-mile down to Tlaquepaque (Aztec meaning “The Best of Everything”), a shopping center dedicated to artisan crafts, jewelry, art and southwestern culture, and modeled on small town Mexico and Spanish Colonial architecture. Once there, we wandered around for a few hours buying gifts for our loved ones (a bracelet, a necklace, and some locally spun pottery), and relaxed in one of the various red tiled, befountained courtyards listening to musicians ply their craft. All around, Tlaquepaque provides a serene ambience that makes for a really pleasant shopping experience, which is enough to distract from the tourist gouging that some of its stores delight in. Definitely a great stop for those with either a big bank roll or good impulse control. Speaking of impulse control, after we left Tlaquepaque, Dayna had gotten her shopping engine pretty revved up, but with few stores selling anything worth buying legitimately in our keepsakes budget, and Dayna’s inner consumer seduced by Tlaquepaque’s siren call, we spent the remainder of the afternoon attempting to add a cowboy hat and a silver/turquoise Native American cuff bracelet to Dayna’s expanding collection of Southwestern style fashions and accessories. Finally, after a long day of driving, shopping and site seeing, we proceeded to our hotel -- The Sedona Rouge. At first blush the Sedona Rouge isn’t an attention grabber, but it proved to be stylish, classy, and comfortable with a great staff. Our discovery of the Sedona Rouge was completely serendipitous. Dayna, who could teach classes in internet wheeling and dealing, discovered a deal on Jet Setter. The pictures of the place looked nice enough, it had solid reviews, and all told, the deal represented about $300 discount over 3 nights, so we rolled the dice. The Sedona Rouge outdid our expectations. Although the hotel entrance is situated off the relatively busy highway 89, it is set back from the street and welcomes visitors with an impressive front gate, a courtyard flanked on either side by illuminated pillars, and complete with ample seating and a multi-tiered fountain. Finally, the entrance is covered by an angled metal and glass roof which appropriately hints at the modern elegance of the hotel’s overall visual style. Happily, our room fully lived up to the raised expectations created by the hotel’s grand entrance by carrying forward the hotel’s bold, modern aesthetic with a king bed worthy of home, a 42-inch flat screen TV, and a fantastic view of the red and green hills rising up from the rear of the hotel. After settling in and splitting one bottle of the case of leftover wedding wine that we brought with us, we rambled over a couple of blocks to Apizza Heaven, a New Haven-style pizza place, owned and operated by a family of Connecticut transplants. New Haven-style pizza is a variant of brick oven baked thin crust pizza served ubiquitously throughout, uh, well, New Haven. Once Dayna, a Connecticut native herself, discovered Apizza Heaven it became a non-negotiable term of our honeymoon planning. She couldn’t have been more excited if she had discovered that Thomas Keller had moved The French Laundry into our hotel lobby and was giving away complimentary meals to all hotel guests. Apizza heaven did not disappoint. While not quite up to the standards of New Heaven’s best pizza joints (Pepe’s, Modern, and Sally’s), which I can personally attest make the best thin crust I’ve ever had, Apizza Heaven makes a creditable facsimile of the genuine article. In other words, it’s a damn good pie. On the morning of day three we tried our breakfast luck at the Sedona Rouge’s restaurant, Red’s, which was delicious. We particularly recommend the southwestern benedict, which was a really creative and tasty take on an American classic. Pork hash, red peppers and onions, topped with poached eggs on a homemade tostada with a chipotle hollandaise and a side of fresh corn cake mash. After breakfast we B-lined for the Pink Jeep Tour office just in time to catch our ride. 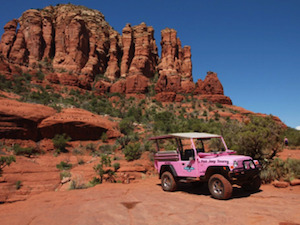 Pink Jeep Tours is the oldest tour company operating in Sedona, utilizing their fleet of, say it with me now - Pink Jeeps - to give various tours of Sedona’s beautiful natural rock formations and ecology. We had a great time on our tour. Our tour guide was clever and knowledgeable; keeping us entertained the entire time. It was also ironically relaxing for a bumpy, dirty off-road trek. In moments, the Dali-esque quality of the landscape can make the relatively non spiritual among us (read me) feel as if he is communing with something greater than himself. I’ll spare further exaltation of this section of the trip to avoid cheapening what words ultimately fail to appropriately capture, and let these pictures speak for themselves. After arriving back at the Pink Jeep Office in the aforementioned commercial center of town, we decided to set out on the 30 minute drive to Jerome Arizona. All we knew about Jerome was that it was a ghost town (or something), had a few shops and was supposed to be pretty cool. Turns out, it was really cool. An old copper mining town built into the side of a mountain overlooking a vast expanse of gorgeous Arizona landscape southwest of Sedona, it was comfortingly familiar and excitingly exotic at the same time. It was as if someone had uprooted San Francisco’s Haight-Ashbury and plopped it down in an Italian hillside town. In the late 1920’s, in its mining heyday, Jerome’s population topped 15,000, but as the mines dried up, so too did its population and the town slid into moribund disrepair, despite its spectacular views. Today the population rests at a quaint 350 people, and has a small, but thriving shopping district with clothing boutiques, bars and restaurants and all manner of esoterica. We spent the day wandering in and out of shops, exploring the town and taking in the natural beauty. Toward the end of the afternoon we were surprised to discover that has a tattoo shop - Jerome Tattoo Company. Truth be told, it actually has two tattoo shops, which for a population of 350, seems like overkill, but hey, competition is what drives our economy, is it not? Both Dayna and I being of the painted persuasion, we decided it would be fun and spontaneous to get tattooed to commemorate our visit to Jerome. We were disappointed to discover, however that artist whose work we most liked was booked through the afternoon. Not to let our spontaneity be deterred, we did just about the most spontaneous thing one can do, and made an appointment . . . for the following morning. We retired to the hotel for some R&R, and after cleaning up a bit we enjoyed a bottle of Sonoma County Wellington Chardonnay (another carry over relic from our wedding) in our hotel’s beautiful and serene outdoor lobby area. We then made our way over Dahl and DiLuca, an upscale Italian restaurant recommended by Dayna’s mother. We were greeted at our rose petal covered table by the bottle of champagne I had secreted away and given to the hostess when Dayna wasn’t looking, which we promptly popped in celebration of the wonderful gifts our new life together had already given us. Our meal was outstanding, second (in my opinion) only to Tom Colicchio’s Craftsteak among our Honeymoon meals. To start, we shared the caprese, which truly honored the tradition Italian cuisine – simple recipe, focused on high quality ingredients. The Campari tomatoes were spectacular, sweet and tender without being mushy, crisp without being hard and mealy. It was finished with a light and mild buffalo mozzarella, which seemed to melt away, fresh cut basil and a tradition balsamic and olive oil drizzle. In addition, I relished every bite of the veal and prawn scaloppini which was beautifully complemented by the rich but not overwhelming mushroom-marsala sauce. In typical Dayna fashion, she enjoyed her favorite Italian classic capellini pomodoro, which is angel hair tossed with fresh tomatoes sautéed garlic, olive oil and a hint of pesto. I have to say, I have a rich and salty palate, but the delicacy of Dayna’s angel hair was surprisingly delicious elegant despite its simplicity; another example of traditional Italian food done exactly right. Finally what Italian meal would be complete without a classic homemade Tiramisu? It was supple and light with just the right combination of rum and espresso soaked ladyfingers. I am typically not a fan of booze in my desserts, but the rum in this tiramisu gave it a nice spicy bite, which complemented the sweetness of the dish and cut the bitterness of the espresso perfectly. Highly recommend Dahl and DiLuca. We awoke the morning of day four with a start - missing our alarm by an hour. Oh well, it’s our honeymoon, we’ll do as we damn well please. Even so, we hurriedly got our act together and rushed out to make it make it to our 10:00 a.m. appointment, which our chosen artist had graciously agreed to open the shop two hours early to accommodate. Word to the wise, the last person in the world you want to piss off is your tattoo artist. We blasted out highway 89 and made it to Jerome with enough time for a quick latte before our appointment. Our artist, Chip, is a 6-5, goateed 50-something former marine who got his start tattooing while still in the military, and who despite his intimidating visage, is really a big teddy-bear with a southern gentleman’s charm. After BSing with Chip about tattooing, marriage, travel, the goods and the bads, we decided to get down to business. We chose a very literal, but in my mind, whimsical approach, having the longitudinal and latitudinal coordinates for Jerome tattooed on her ankle and my calf respectively. It was a great time, and we both left Jerome Tattoo Company with a meaningful keepsake that will literally last a lifetime. We spent most of the remainder of the day exploring the town and surrounding area. We had drinks and a snack at the Jerome Grand Hotel. Perched high on a hill overlooking the entire town and the valley far below, the Jerome Grand surely tickled Dayna’s fancy for kitsch, embracing its creepy past as a hospital and lunatic asylum. The hotel offers ghost hunting tours, paranormal swag in the gift shop, and a bar named, you guessed it, “The Asylum.” If I ever make it back to Jerome, I will definitely plan to stay at least one night in the Jerome Grand. Speaking of kitschy, from there we moved on to the Gold King Mine Ghost Town. The Gold King Mine was once an operating gold mine, now a manifestly kitschy tourist attraction and junkyard, as well as hobby, playground, and home for Don Robertson and his wife. Gold King Mine is impossible to truly describe without a Dickensian level of detail, but the highlights are telling. The first thing we saw upon entering was a giant log cutting saw fashioned to look like a dragon, and run by a repurposed WWII era diesel submarine engine, all of which we later found out was hand fabricated by the quirky and extremely talented Robertson. The day had turned drizzly and the ground muddy, and we continued to explore the grounds – an old broken down auto parts store, a rickety abandoned dentist’s office containing a set of antique dental equipment and a slew of extracted teeth, and a variety of other decrepit structures, rusted out cars and trucks. As if the scene wasn’t already set for our brutal murder at the hands of a psychopath (honeymooners, alone at a very strange, very off the beaten path tourist attraction, on a grey and drizzly day), our exploration of the Gold King Mine led us to another of the hodgepodge of rickety wood structures littering the property – a barn style garage with no fewer than 10 chainsaws hung from the ceiling like chandeliers by thick rusty chains and hooks. Just then we met the proprietor, Don Robertson, who, if he doesn’t look like a potentially murderous psychopath himself, certainly looks at least like a minion of one. Truth be told, Don is a really sweet, interesting and talented guy. He was excited to have visitors on such a gloomy day, so he took time to show us around to some of his favorite spots on the property. The crowned jewel of the property in his mind, which being a gearhead myself, I do not dispute, is Don’s completely hand fabricated replica of a vintage 1930s era open-wheel racecar (Indy Car), powered by a rebuilt Studebaker engine. The replica is so faithful that Don has been invited to race at numerous vintage events, despite the car’s lack of a true vintage pedigree. After discussing the car, Don’s talent for metal craft and his life in general, he introduced us to his donkey – Pedro Gonzalez Gonzalez Gonzalez (not a typo) – and his Chihuahua, Killer, who chooses to live the overwhelming majority of his life in the front side passenger seat of an old beat up 1950’s era pick-up truck. We had a great time, and I am happy to report that both of us left Gold Mine King with our limbs, organs and lives fully in-tact. For our final activity on day 4, we stopped off for a few small plates and cocktails at Enchantment Resort on our way back from Jerome. Enchantment Resort is spectacular collection of haciendas, with a full complement of resort activities tucked away in it its own little valley within the mountains around Sedona. While lounging on the huge stone patio at the resort bar, we drank strawberry margaritas and took in breathtaking view outward between the towering red walls flanking the hotel, and on to the horizon dyed orange and pink as the sun set amongst the dispersing cloud cover. 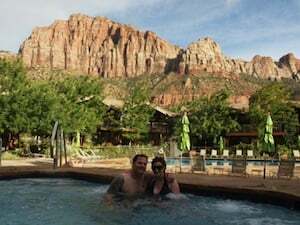 While staying at Enchantment Resort wasn’t in the budget for this trip, it will be high on our list of priorities for our next trip to Sedona. We set out bright and early on day five and after a quick stop for breakfast on our way out of town, we embarked northbound through Flagstaff and on to the Grand Canyon. Unfortunately, we hadn’t decided on a Southwest road trip honeymoon far enough in advance to book any of the Grand Canyon’s more involved activities (donkey rides to the canyon floor, multi-day rafting expeditions, etc.) and frankly, given our 10-day schedule it would have been difficult to fit something like that into our agenda anyway, but having been there before, I knew that just seeing the Grand Canyon was well worth the drive, even if only to stand there and gaze at its majesty for 10 minutes. The drive from Flagstaff to the Grand Canyon runs around the 6,000–7,000-foot elevations through Arizona’s evergreen Kaibab and Coconino forests. There are portions of the drive during which I could have sworn that I was driving through California’s Sierras, a beautiful counterpoint to Arizona’s dry, deserty image. The driving portions of our road trip were becoming one of my favorite parts of the trip. In fact, they may have been the portions of honeymoon among numerous relaxing parts, during which I felt most at peace. There was something truly meditative about the often desolate landscape whipping by, while Dayna and I were tucked away in our car listening to the soundtrack of our trip (Band of Horses, Fleet Foxes, Paul Simon, Neko Case and others) and discussing love, life, each other, and other times simply allowing the ease of nothing tell us all we needed to know about how we set one another at ease. But alas, all good things were meant to end, but sometimes allow a differently awesome experience to enter one’s life. In this instance, our peaceful journey was interrupted by the jarring, and bizarre presence of Bedrock City, a Flintstones themed tourist trap . . . errrr amusement park, situated along Arizona highway 64 approximately 2/3 of the way between Sedona and the Grand Canyon. I secretly knew that convincing Dayna to forego a stop at Bedrock City was as likely as defeating the Borg – resistance was futile. I didn’t even try. I can imagine that possibly at some point in its early history, Bedrock City was probably at least a mediocre pit stop to let the kids blow off some steam, but now, in its current Elmers glue and bailing wire constructed incarnation, it is absolutely splendid in all of its ironically creepy glory. A life sized playground style mockup of the town of Bedrock, it now looks like Hanna-Barbera meets Cormac McCarthy. Owing to the grey and drizzly morning, every single structure on the property was leaking, the creepiest of which was the Bedrock movie theater - a dark, loud and echo-filled concrete room with warped and flaking bench seating, six inches of standing water, two water-stained curtains to block the incoming light from the “lobby.” Flintstones cartoons played on a loop while water dripped audibly through the roof into the pool below. We wandered the grounds for 15 minutes or so before briefly stopping in the gift shop to browse, carefully dodging the many half-filled buckets of rain water that had leaked through the roof, and then quickly got back on the road. In a vacuum, it certainly wasn’t worth the $10 in entrance fees, but there’s no question we came home with $10 worth of memories from Bed Rock City. We arrived at the South Rim around noon and headed right to the rim trail, a paved pathway that tracks the edge of the south rim for a total of 9.5 miles. This is the only easy hike at the Grand Canyon. Pretty much everything else is a back-breaking round-tripper. Being that we did not plan an overnight stay, that kind of rugged adventure just wasn’t in the cards, so we hiked the rim trail for about an hour stopping often to view and take pictures of the world’s biggest (and arguably most beautiful) ditch. I had last been to the Grand Canyon at 13; now 34 I had forgotten the unfathomable magnitude of the Grand Canyon. Not ready to leave after our hike, we ambled over to El Tovar Hotel, a beautiful 78-room hotel constructed, and continuously operated since 1905. We sat on the deck adjacent to the bar and enjoyed a beer while gazing out over the canyon. Our timing turned out to be perfect, for just as we finished our hike, the clouds had rolled in and treated us to a lighting storm of epic proportions. We sipped our beers and watched with exhilarated intensity as lightning strikes made landfall all across the north and south rims in an exhibition that would shame even the greatest fireworks show. After about an hour of waiting for the driving rain to break, it didn’t, and we decided that it was time to make our move, sprinting from the hotel bar out to the parking in the futile hope of staying dry. We failed. Miserably. Oh well. Even the smallest adventure can make for memorable moments. I’ll never forget how beautiful Dayna looked sitting in the passenger seat of our car with windows fogged up, her hair glued wildly to her face by the rain with her mascara tracing tiny rivers down her cheeks, smiling back at me. We shared a kiss, and continued on, searching for the next adventure. Our next destination was Page, Arizona. Page is not a particularly nice looking or culturally rich town, but it is home to the spectacular Lake Powell, and more relevantly for our purposes, the northeastern most section of the Colorado River’s trek through the Grand Canyon, our destination for the following day. Driving out northeast, we tracked the south rim for the next 50 miles or so before turning due north to Page. Even in the comforts of our German luxury car, it was impossible not to become swept up by the rugged frontier spirit of the expansive mesa scarred by the canyon. I couldn’t help feeling nostalgic about a time and place that I hadn’t even experienced, but only read about in books and seen in movies. Despite my enjoyment of being taken back to the sense of adventure I felt with respect to the invented childhood memories of my imagined life in the wild-west, I was also keenly aware that we were driving through the barren, but beautiful Navajo reservation, a sobering reminder of the harsh realities underscoring the naiveté of those childhood fantasies of playing cowboys and Indians. After another 90 or so minute drive, we arrived in Page, welcomed by Lake Powell, and proceeded into town to check into our motel. We were only staying for one night and knew that we would be arriving in the evening and leaving around 6:00 a.m. the following day, so luxury accommodations were not a priority. With that knowledge well in advance, Dayna had researched and found an allegedly cute and highly rated motel in central Page called LuLu’s Sleep-Ezze Motel, which had received and average of 4-stars over 115 reviews on Trip Advisor. To be blunt, I don’t know what universe these 115 people come from, but I knew something was wrong the second we made the turn onto Sleep Ezze street. Between the beer can littered front yards, the concrete cinder block construction of several of the buildings, and the people wandering around in the middle of the street, I could have sworn we were driving through Hamsterdam (check out Season 3 of The Wire). To top it off, the motel itself looked like the kind of place a fugitive criminal might hide out or stash his kidnapping victim. We did not stay at Lulu’s. Instead, we quickly pivoted and were miraculously able to secure a decent rate at the Lake Powell Resort through Hotels.com with only 30 minutes notice. I say miraculously, because when we arrived, the parking lot was overflowing with cars and the check-in line was thirty people deep. But, we managed to get checked in, enjoyed a pretty darn good dinner at the resort restaurant, and got a great glimpse into what the golden years have in store for us. We arose before sunrise on Day six and drove to catch the tour bus that take us down to the launch point for our up-river float on the Colorado river. Because the launch point is so far up river, directly at the base of the Lake Powell Dam, in fact, the water does not flow quickly enough for white water to develop. What results is a truly beautiful and serene 4 hour float down the Colorado. Our tour company - Colorado River Discovery – has a special dispensation from the parks service to utilize the access tunnel road that reaches the dam base launch point, and therefore is the only tour company that operates this type of up-river float. Over the course of four hours, we learned a great deal and were highly entertained by our tour guide, Triple A. We saw big horn sheep, ducks, California condors (which have been transplanted to the area for re-speciation), and a peregrine falcon. There was also a stop along the way to view ancient native American petroglyphs. We arrived back at the Colorado River Discovery office and took off for Zion National Park in Utah. On the drive out we were treated to another gorgeous lightning storm, this time driving right through it as lightning strikes made landfall within what looked like only a few hundred meters, but in reality was likely much further than that. It was another beautiful drive taking us through over a hundred miles of open plains, horse ranches, a red and white sand dune desert and mountainous craggy terrain. Of course, no leg of our journey would be complete without a stop at a roadside attraction. This time it was Moqui Cave, a natural cave, turned bar in the days of prohibition, now turned museum and repository for Native American artifacts, dinosaur fossils and glowing minerals of all types. It was a cute little diversion on our way to Zion, but really not much more than a quirky bathroom break. Our route took us through the eastern entrance to Zion, and therefore required us to transect the entire park to reach our hotel in Springdale, the town literally spitting distance from the park’s western exit, which was a welcome treat, getting to view Zion’s soaring red and white peaks, bulging cracked domes, and deep lush valleys. We arrived at our hotel, the Desert Pearl Inn, in the early afternoon, which enabled to take a short hike into the park before returning to the hotel for a glass of wine and a hot tub respite. We highly recommend the Desert Pearl. It is situated less than a mile outside the park exit, which means that from its classy pool deck and hot tub, you have 360-degree views of the surrounding peaks. The rooms are very stylish and modern, in the same vein as the Sedona Rouge. Our room had a cozy back patio with views of the pool deck and the hills beyond. The next morning we grabbed a quick bite on the coffee shop next door to our hotel and hopped on the shuttle over to the Zion Lodge where we would meet our tour guide for a half day horseback ride through the valley. We had a great time trekking through the Zion wilderness with the red and white peaks soaring thousands of feet above us, Zion lives up namesake. On top of the scenery , the weather was perfect in the mid-70s without a cloud in the sky. The morning would have been perfect were it not for the fact that my horse and Dayna’s horse were very attached to one another, both having recently arrived at Zion from a ranch in Mexico where they were raised together. As a consequence, my horse insisted upon walking with his face as close to Dayna’s horse’s hind quarters as possible. This issue, combined with Dayna’s horse’s flatulence problem, created a truly noxious result, that undermined the perfection of the ride somewhat, but in retrospect still delights my inner-13-year-old. After the ride, we grabbed lunch at the Zion lodge and then immediately hopped on the shuttle to try to sneak in a 3 or 4 hour hike of the lower section of the Zion Narrows trail, one of Zion’s famous and spectacular slot canyons. Unfortunately, after riding the shuttle and hiking the mile into the canyon trailhead, it began to rain just as we reached the river crossing. For the unaware, rain + slot canyon often = flash floods. A not insignificant number of people have drowned in flash floods while hiking the narrows, so after 30 minutes of deliberating, we gave up and turned back. It was a disappointing turn of events, but we found an alternate hike (the Kenyatta Trail to the Emerald Pool), which, while not nearly up to the standards of the narrows in terms of rigor, was still beautiful and allowed us to get something of a bird’s eye view of much of the canyon with its sandstone monoliths, dome-like mountains, formed from ancient sand dunes, waterfalls, and all manner of curved, jointed, and faulted rock facades, and finally the emerald pool. – Arrive at Wynn – Valet car – Check in – Gamble (lose money) – Grab lunch (spend way too money) – Gamble (win some of lost funds) – Go to the poolside bar (drink drink drink) – Go back up the room – CENSORED – Go to dinner at the La Cave ( spend way too much money on tapas) – Eat white truffle and gorgonzola pizza, seared pork belly, arugula salad, etc. – Feel sick and bloated from overeating – Gamble (lose winnings from earlier) – Hop in limo – Get out of limo – Pay cover charge – CENSORED – Return to hotel – Go back to the room – CENSORED – Go to sleep – Wake up late – Go to buffet – Hang by the pool – Shop – Gamble (lose more money) – Take cab to MGM Grand – Eat at Craft Steak (best filet I’ve ever had) – Share bottle of 1999 Perrier Jouet we have been saving for a special occasion – Get caught in the mass of humanity exiting the Mayweather v. Ortiz fight – Return to Wynn – Drink drink drink – Gamble (break even) – Return to room – CENSORED – Wake up – Be simultaneously happy and sad to leave Vegas – Leave Vegas – Drive to Oakland – Be sad that our Honeymoon is over, but thankful for an amazing experience. 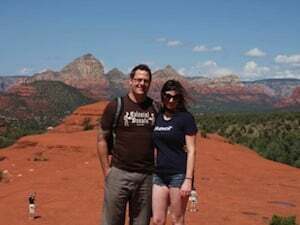 I am so glad that Dayna got to experience one of her life long dreams of doing a Southwest road trip, and on her honeymoon no less. It was perfect from start to finish, and between our regular expenses and paying for our wedding, we wouldn’t have been able to finance it without Traveler’s Joy providing us with this amazing way to hit our friends for honeymoon funds without having to explicitly ask them for money. Pure genius Traveler’s Joy!